I've been having a bit of fun hopping down memory lane. Time really does seem to fly by so fast. I'm at the quilt festival today, so I decided to share this post with you which originally appeared on September 30, 2011. 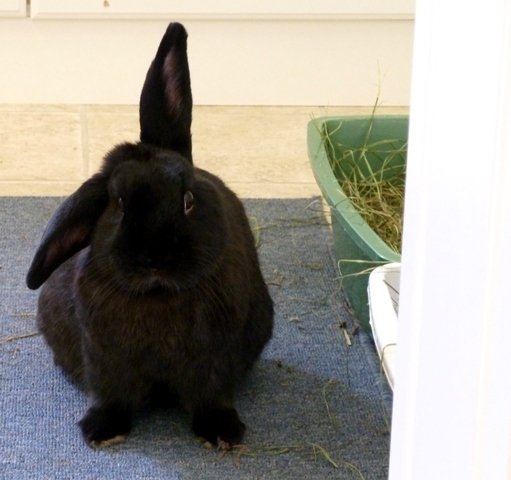 When I originally wrote this post, we had adopted Hannah from the rescue four months earlier. Enjoy! Update for February 28, 2014. Of course, you now know they won their lawsuit. 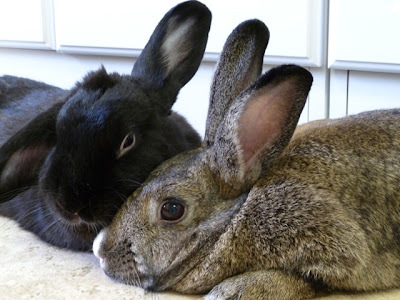 They also threatened to terminate their employment at The Raspberry Rabbits, which would have resulted in much disappointment for all those who participated in The Adventures of Harrington and Hannah BOM (soon to be re-released on Craftsy). 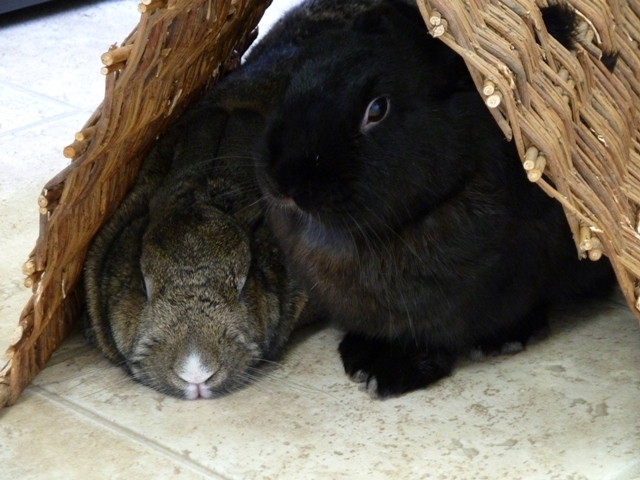 In the end, they received a posh corner office in Bunnyville and extra banana chip snacks. Time is flying! Of course that's what happens when you are having fun! Week 9 of the Fellowship of the Flowers is the Peach Blossom. This is the last of the 6 flowers being used in the project, which you get to see today! Remember, you can join the Fellowship anytime between now and December 17. Click on the tab above for all the information. I must say I had lots of fun making the flowers for this project. I looooooove hand stitching. It's nice to have something portable to work on. Plus I find it relaxing. So...this month's mystery project is a table topper! The bees are having their own fellowship with the flowers. hee,hee,hee. Members of the Fellowship will receive instructions for this project no later than 6:00 p.m. EST today. If for some reason you don't get the email, please let me know. The project is for members of the Fellowship only and will not be sold as an individual pattern. 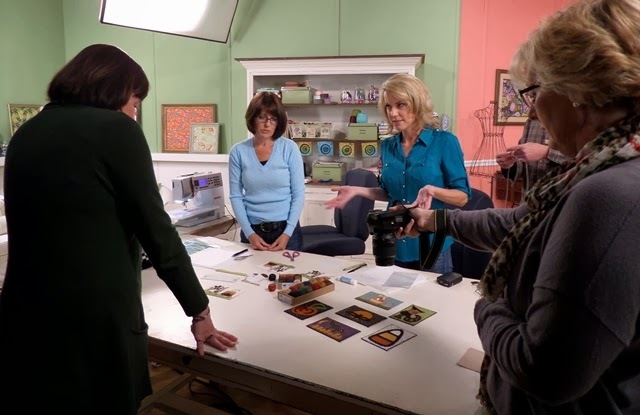 I used Captain's sunroom for my photo shoot. I thought it looked perfect with her furniture. What do you think? 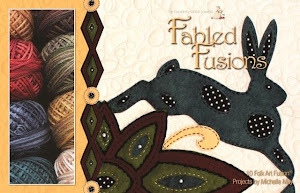 These projects are fun because you can be creative with embellishments and use up some things you might have in your stash or perhaps go get some new things! The rick rack has been in my stash for several years. I'm happy I got to use it. I've decided I'm going to go back and add some beads to all the bees. I like how it looks. I can't wait to see what your table topper looks like. Remember to join the groups and share your photos with everyone. The links to the three groups are on my sidebar. Please forgive me if I don't get to everyone's personal blog to see photos. I have a hard enough time keeping up with my blog, business, three groups, facebook and life in general. I created the three groups to make it a little easier for me to enjoy your creations. Finally, I'm headed to Virginia tomorrow to visit my family. My aunt and I are going to the Mid Atlantic Quilt Festival in Hampton on Friday. 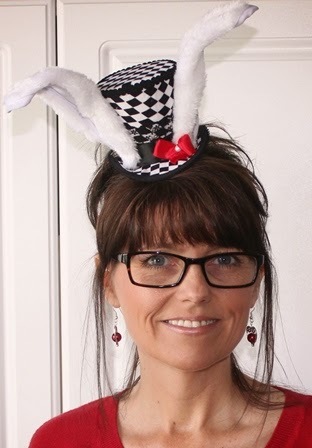 I'll have on my bunny hat, so say hi if you see me there! Last Tuesday night was our Croatan Quilters Guild meeting. Such a wonderful time. Here's some of the show and tell shared by my friends. Isn't this gorgeous? All those points! 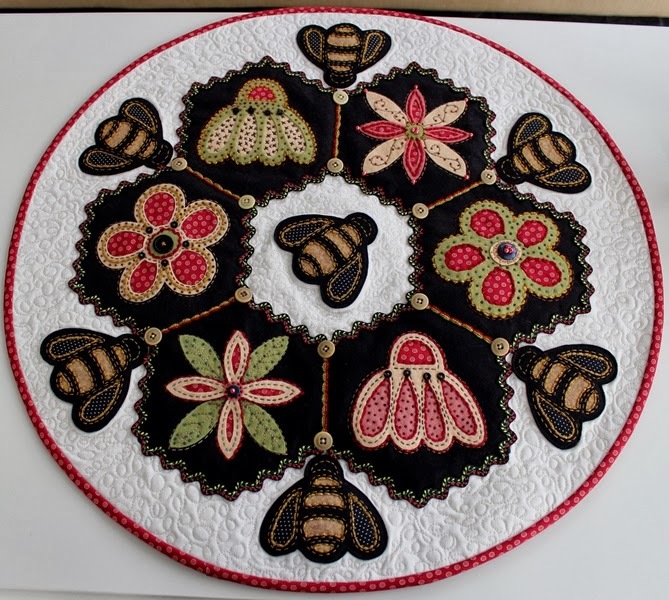 Marianne (peeking around the quilt) shared this piece with us. It was made by her sister, Lesley. The pattern is from Bonnie Hunter and it's called Celtic Solstice. Breathtaking! Again...all those points! Next, some of the gals just returned from the annual beach retreat. This is Holly (retired Marine! Hoorah!). Holly was excited because she learned how to do paper piecing and make a Grandmother's Flower Garden block. She called it Holly's Daisies. I think Holly's Hexies sounds even better. What do you think? Holly also share some of the tops she finished at the retreat. These are some of the fabrics she collected in her travels with the Marine Corp.
On the retreat, Peggy taught her how to make a tied fleece throw. This one featured golf fleece. Next, Marly shared some of the blocks she made at the retreat. Can I just say that "I WANT MARLY'S SHOES!!" Actually, I want her entire outfit. She is such a snazzy dresser. So stylish. I love how the quilt blocks match her outfit. Charlene had lots of cute things to share from the retreat, but good gracious...that woman is as quick as a bunny! Every picture I took came out blurry! She's so darn cute. Love ya sweets! Lori shared her new jacket. Loooooooove it! Of course, my wardrobe is mainly black, white and gray, so I wanted to steal this too. I think it looks fabulous on her. She also shared a quilt she made from fabric and blocks that were left on our "grab table." I swear I think that floral fabric was mine. Honestly...it think it was. Her son said, "Oh is that an old fashioned quilt?" We all told her it's not old fashioned, it's "Vintage." That sounds more hip. hee,hee,hee. Then she shared a quilt she made for the children's charity we support. I love the saying on this. So sweet. Sandy shared this adorable monkey quilt. The gals did a "Critter block swap" last year. Sandy got all monkeys. Fun! She also shared a kiddo quilt she made with Minky. Ooooo soooooooooo soft! Then she shared this kiddo quilt she made with fabrics she purchased from Tuesday Morning. They actually came in a bundle. Renee had this fun bag. She covered over the boring logo on a bag with this patchwork. I love it as I'm one of those people who brings my own bags to the grocery store. I despise plastic bags. Great job Renee! as well as this embroidered quilt. Her Grandie Boy likes sharks. Cool! Last month Peggy shared a few strips of the quilt for her Grandie Daughter who will be graduating high school. 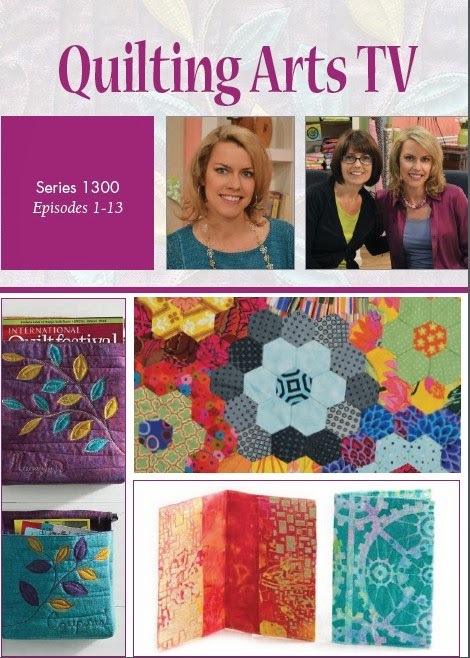 This month she shared the completed quilt. Her back was killing her (mine would too after all those POINTS!) so some of the gals helped her show the quilt. If you're wondering if the back of the quilt still looked as neat and tidy as last month, here's your answer. I must say I have "Backside Envy." Oh wait...that sounds weird doesn't it? Hee,hee,hee. Peggy also shared this quilt called "Rolling Thunder." This was a block swap we did a loooooooooong time ago. My block is on the bottom row with the black and cream. Peggy loves Thimbleberries fabric. Then she shared this quilt she made from the Critter Block Swap. Cute! Mary is organizing a nursery rhyme quilt challenge for the local library. This fun piece is her contribution. Can you guess what nursery rhyme it is? She did a great job of thread sketching and this was her first attempt with piping. Well done! Our wonderful President, Vicky, shared this stunning quilt she made at the NC Quilt Symposium with Pepper Corey. I loooooooooooooove the colors and the pinwheel block is one of my favorites. This quilt is gorgeous! I also want to send out big hugs and prayers for Vicky. I still can't believe she came to lead the meeting that night when the next morning she was having MAJOR HEART SURGERY!! She is doing great and on the mend. Happy bunny dance! We love you Vicky! Part of my show and tell that night was my friend, Karen Maust. Karen lives in MA and was visiting her daughter here in NC. I was so excited she made a detour on the way home to come spend the night with me! Karen and I are long time blogging friends. 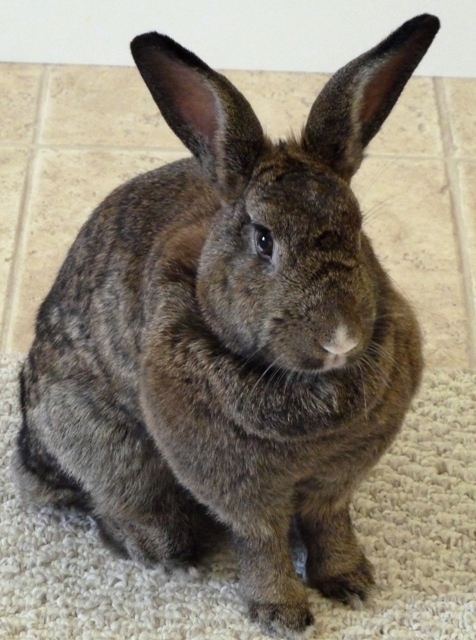 She is also a bunny mom to two rescue rabbits as well as a wonderful quilt artist. I wish she lived closer to me. Love ya girlfriend! 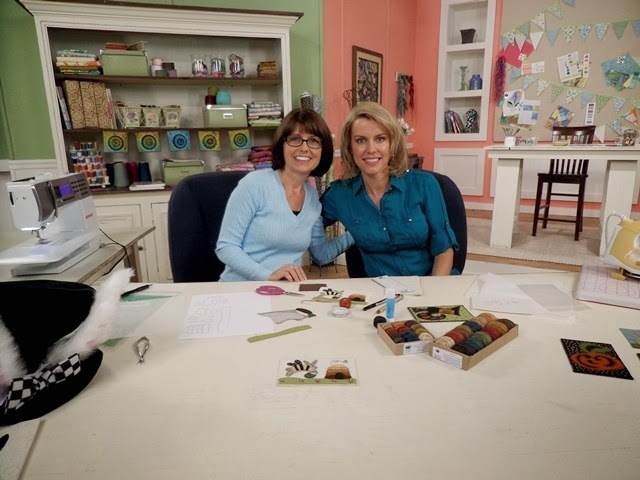 Marianne and Mary Kay from guild own a framing shop. My friend Sue Pickwell got this bag for me all the way from the UK. It is really a brand of rabbit food they sell in the store! I love it! I was so excited to have the girls frame it for me. It's like a piece of folk art. It looks wonderful in Bunnyville hanging near Harrington and Hannah's corner office. 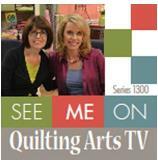 Finally, the first of the four episodes I'm in on Quilting Arts TV airs today in many parts of the country. It is episode 1305. I'm in episodes 1305, 1306, 1309 and 1311. Check your local PBS station HERE to see if you get it. Unfortunately, my local station is still airing the 1200 series so I will have to wait. Poo! I must say that it was truly an honor and privilege not only to be on this show with host, Pokey Bolton, but to have also have made the cover of the DVD. Pokey resigned as host of this show after this series. It was a dream come true for me to meet her and to be on the show. Thank you Pokey for 13 awesome years of inspiration and adventure. You will truly be missed. Ok...so there ya go. Have a fun start to your week. I'll see ya right back here on Wednesday for Fellowship of the Flowers and our second project! Hoppy Friday! - Clap Along!